When I was a lad, it was the law that every school had a religious assembly and, at my primary school especially, we used to sing 3 or 4 hymns every morning. In the assembly hall, we had two enormous (to a 10 year old) contraptions that dangled enormous hymn sheets from the ceiling. One of the occasional duties of a 10 year old at my school was Hymn Sheet monitor. There were two monitors to each hymn sheet contraption and, when the music teacher said ‘Hymn number 127’, one of the monitors would undo the rope from the cleat and lower the contraption from the ceiling. The other monitor would then rummage through the giant (to a 10 year old) sheets of paper looking for hymn number 127. After lots of searching and then hefting of hundreds of sheets – each bigger than a 10 year old – the first monitor would heave on the rope to return the contraption to the ceiling and then hang on with all his strength while the other monitor belayed the rope to the cleat. Then the singing would commence. The singing was fantastic. I remember one time, we had a visit from the Mayor of Bexley in all his mayoral robes and he pronounced that “he would always remember this as the singing school”. We sang every one of those hymns. There were the hymns that everyone knows like What a Friend we have in Jesus and All Things Bright and Beautiful and Onward Christian Soldiers but there were also a few pop-songs-turned-hymns like Lord of the Dance, Morning has Broken and Any Dream Will Do from the latest (and first) Rice/Weber blockbuster and plenty of obscure songs that I have never heard before or since. I was reminded of one of those obscure songs last week – my absolute favourite – when I read the most beautiful passage in the New Testament in Luke while camping at Sunset Beach. 36 And one of the Pharisees desired him that he would eat with him. And he went into the Pharisee’s house, and sat down to meat. 37 And, behold, a woman in the city, which was a sinner, when she knew that Jesus sat at meat in the Pharisee’s house, brought an alabaster box of ointment, 38 And stood at his feet behind him weeping, and began to wash his feet with tears, and did wipe them with the hairs of her head, and kissed his feet, and anointed them with the ointment. I loved that song. I wish I remembered all the words. I have the melody down on my harmonica but my memory, and Google, fail me for the lyrics. Said Judas to Mary, “O think of the poor. “Tomorrow, tomorrow, I’ll think of the poor. Tomorrow.” she said. “Not today. For today I must think of my only true Lord. It’s funny how memory works – for that song to spring back into my mind so nearly complete after 30 years. I wish I remembered the rest. The whole nativity is only 20 verses of Luke, less than that in Matthew and not covered at all in Mark and John. Matthew and Luke made those little bits up but, in 2000 years, we did the rest. Today you may do as you will. ‘To the end of the world they shall be. Thank you, David! You are my hero! I got in touch with a friend yesterday who operated the other hymn sheet all those years ago and he couldn’t remember the song at all! I woke up at 4 am with a snippet of music in my head and I had to get up to do a Google search because it was driving me quietly insane. All I could remember was ‘ointment so rich and so rare’ ..and …’I’ll wipe it away with my hair, she said’.. It was such a great hymn for children – all mellow and slightly mediaevil sounding-in the midst of all the tedious tunes we had to teach back in the seventies; and there I came upon you who was in the same predicament 9 months ago.I went on to see if I could track down the words and when I did I came back to send them to you, only to find that someone else had already done so. Brilliant. I wonder if he was up at 4 am with that haunting tune driving him to distraction too. Anyway, thank you for being the route to my sanity. I shall suggest that the young jazz musician at my school teaches it to this generation of children to keep it alive. What brings back these ancient memories out of the blue I wonder? I get flashes of memory from my childhood where I am *right there* like it happened just now. I hope they never stop. Hi Kevin, Helen again. Oh my God, this is getting seriously bizarre ! ‘Said Judas to Mary’ is also my all-time favourite hymn but no-one else I’ve ever mentioned has ever known what I’m talking about ! Bit of a worry as I’d like it at my funeral…! We always sung a couple of hymns every day at my primary school and I was overjoyed when it was this one. I always felt that the other children liked the ‘happy’ hymns whereas I took delight in the more melancholy side of things. My mum thought I was a bit weird as she didn’t like the imagery in the hymn. I would get a serious lump in my throat especially in the last two verses. It’s just such a beautiful theme and melody, perfect. It’s late in the night and I’m a bit tired but this has freaked me out slightly ! Don’t know if your school also sang ‘Let All Mortal Flesh Keep Silence – another jaunty little number with a dark medieval tone ? Signing off, Helen from Bizarresville, London E14. By the way – the other hymn sheet monitor was Mark (see – http://www.raggedclown.com/2009/06/09/reunions-ftw/). He claims that he and Ian Turner were the Fastest Hymn Sheet Monitors in the West – but it is not true. said judas to mary, now what will you do with your ointment so rich and so rare? 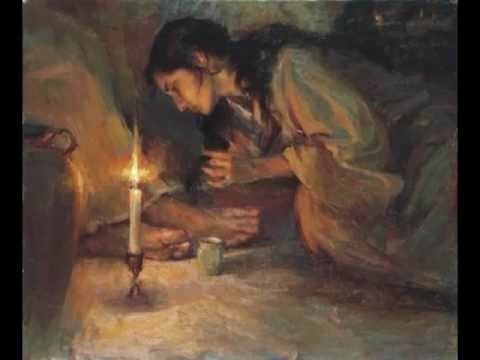 I’ll pour it all over the feet of the Lord and i’ll wipe it away with my hair, she said, i’ll wipe it away with my hair. said mary to judas, “tomorrow, tomorrow, i’ll think of the poor. tomorrow, she said, not today. for dearer than all of the poor in the world is my Lord who is going away, she said, my Lord who is going away. said jesus to mary, “your love is so great, today you may do as you will. Tomorrow you say, “I am going away” but my body i leave with you still, he said, my body i leave with you still. the poor of the world are my body, he said, to the end of the world they shall be. the bread and the blankets you give to the poor you will find you have given to me, he said, you will find you have given to me. Just remembered this hymn and couldn’t remember all the words. Thanks to Google and you all for reminding me! I still love this song! Today we sung the melody of this song on other words. I knew the song ‘Judas and Mary’ starting with b e e e b b b a g fis e etc. The song of this morning had the same melody I knew, except the beginning: b e b b b b b a g fis e. The song of this morning was sung in a churchservice and the people had difficulties with this bbbbb in the first sentence. Can someone tell me what the original melody is that Sydney Bertram Carter composed? The sheet music that I just found online has b e B B B B B.
but I remember it as b e e e B B B too. Previous Previous post: Why Radians?